I'm always looking for someone to give me a day off from this accursed job. 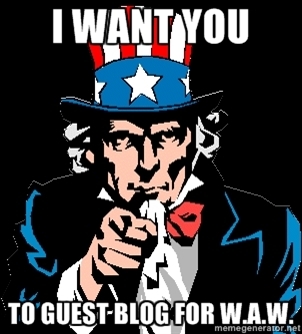 Be sure to read the post about guest blogging thoroughly. I don't make enough to pay my guest bloggers up front or guaranteed (yet), but if your article does well, I won't keep the fruits of your labor either. The same mostly goes for blogging for you, although I have a slightly different set of requirements for that since I'm the one doing the writing. Follow the links. All will be VERY clear.